Peter Galbraith announces his candidacy for governor at the Statehouse. 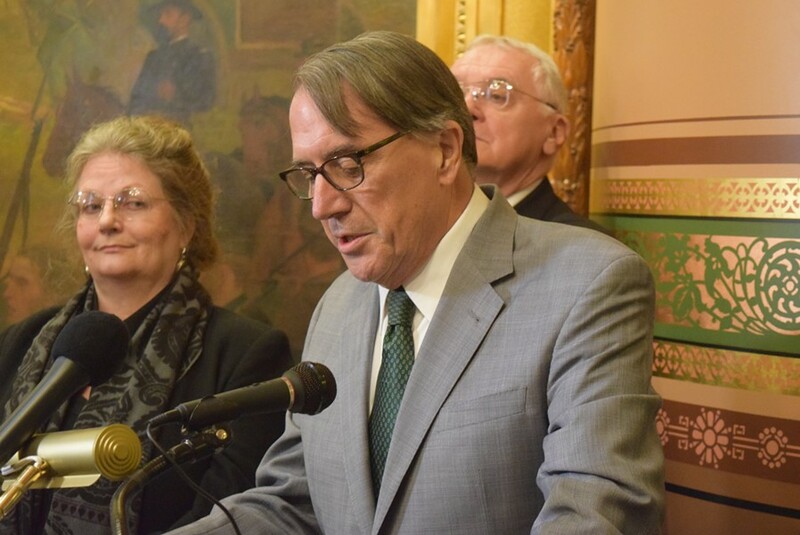 Peter Galbraith, a former state senator and diplomat, outlined an unusual political platform Tuesday as he announced he’s running for governor. The 65-year-old Townshend Democrat wants to ban wind turbines and raise the minimum wage, positions that could have him straddling a political divide. Galbraith is the third Democrat in the race to replace retiring Democratic Gov. Peter Shumlin. He’ll compete for the party’s nomination with former state senator Matt Dunne and former transportation secretary Sue Minter. Two Republicans, Lt. Gov. Phil Scott and retired Wall Street executive Bruce Lisman, are seeking their party’s nomination. A son of the late economist John Kenneth Galbraith, the candidate served as ambassador to Croatia under President Bill Clinton and has worked as a diplomat in Afghanistan and East Timor. Though he has spent much of his career working abroad and in Washington, D.C., he has claimed Townshend as his home since about 1970. Galbraith said he continues to work as a consultant, most recently for a British organization advising Syrian Kurds as they prepare for potential peace talks. “There’s no secret I travel a lot,” said Galbraith, whose wife lives in Norway. Known for his prickly demeanor during his four-year tenure in the Senate, which ended in 2014, Galbraith promised to shake up what has been a low-key governor’s race. “Elections are about choices,” he said. The supporters flanking Galbraith offered an indication of just how unusual his campaign could be. To his right was former state representative John Moran of Wardsboro, a liberal, labor-friendly Democrat who considered running for governor himself before backing Galbraith. “It’s hard to think what I’m not on board with on his platform,” Moran said afterward, pointing in particular to the candidate’s support for a higher minimum wage. To Galbraith’s left stood Penny Dubie, wife of former Republican lieutenant governor Brian Dubie, who is fighting proposed wind turbines near their Franklin County home. In his speech, Galbraith vowed to work toward getting rid of “special interest” tax breaks, renewing the push for universal health coverage, ending state subsidies for businesses, barring corporate campaign contributions and banning industrial wind turbines. All those positions, he said, fit under the umbrella of economic justice. They are also issues Galbraith focused on in the Senate, where he often butted heads with his colleagues. He tried unsuccessfully during his second term to establish a 2.2 percent payroll tax to pay for universal health care. Galbraith said Tuesday he’ll push for that or universal primary care — and he promised to identify a funding source for any health care plans he proposes. He said he would seek a $12.50 an hour minimum wage immediately upon election, and then pursue a $15 wage down the road. The current minimum wage is $9.60. While the Republican candidates for governor have expressed reservations about large-scale renewables, Galbraith is the only one in the Democratic primary appealing to wind opponents. 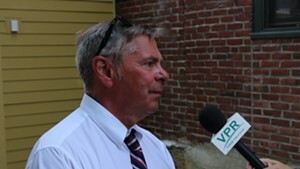 “The primary on August 9 is an opportunity to send a message,” Galbraith told a Tuesday afternoon gathering of wind opponents at the Statehouse. Rep. Chris Pearson (P-Burlington), who chairs the House Progressive caucus, said his party will be watching closely to see whether Galbraith suits them. Galbraith’s Democratic opponents reacted with caution on Tuesday.